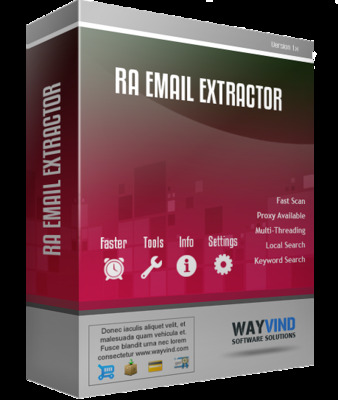 RA Email Extractor was specially designed to extract specific targeted group emails from various sources like search engines, websites and local files etc. based on your effective keyword search. Uniqueness of RA Email Extractor when comparing with other tools available in market is Multi-Threading which extract emails very faster by avoid unnecessary internet usage without compromise with PC performance. Every email marketing campaign success was completely depends on whether list of emails sent to your right targeted audience, where many email marketers missing to do that and expecting high CTR/Conversion or any call to action from the mailer list. RA Email Extractor will create large quality list of emails instantly within 5 -10 minutes where you can start your email campaign even when you at busy work schedule. You can extract 1000 of email addresses in less than a minute with simple few clicks. So don’t wait have a try with our free RA Email Extractor Application. Are you the one who paying high price for the bulk email list, stop paying with RA Email Extractor with one-time fee. We always recommend our every client to Try before Buy.